Regional managers are the in charge in the particular area of the company. The main job of regional managers is to manage the operations in the region under his supervision. Regional managers are also responsible for keeping a check on individual stores so that the cleanliness and proper working of the stores can be ensured. Another job is to keep the store completely stocked. A regional manager is required to write a resignation letter when he wants to change his job for any reason. There are various ways in which you can resign from the company. Many companies specify their own method for handling the resignation. Most of them require a written letter informing about the quitting decision. A resignation letter is handed over to the Human Resource Department of the company. If there is anything additional to share with the employer, share it in person instead of mentioning it in the resignation letter. The basic objective of writing resignation letter is to inform the employer about your decision of leaving and about the date of your departure. The resignation letter shouldn’t be very long but it should be formal and brief. All those details should be provided in the letter, that is actually needed by the reader. If you want to explain the reason for leaving your job, explain it amicably. 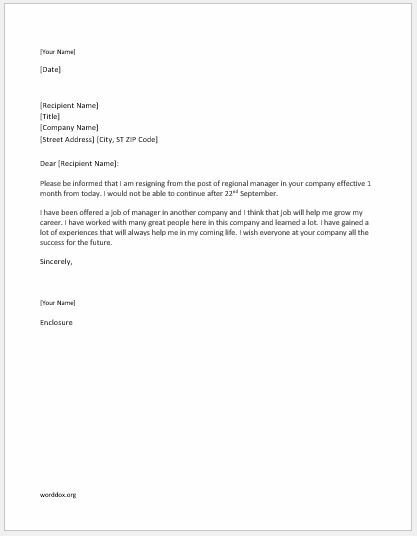 Here is a sample resignation letter for the post of regional manager. Please be informed that I am resigning from the post of regional manager in your company effective 1 month from today. I would not be able to continue after 22nd September. I have been offered a job of manager in another company and I think that job will help me grow my career. I have worked with many great people here in this company and learned a lot. I have gained a lot of experiences that will always help me in my coming life. I wish everyone at your company all the success for the future.